Presenting a comprehensive examination of China’s medical care system, this book tackles issues of policymaking, organization, management and financing in the context of the provision of affordable care in China. Making use of extensive field investigations, interviews and a thorough analysis of documents, this book examines the re-structuring of the medical care system, spanning more than three and half decades from 1979 to the present day. Assessing the difficulties of regulatory control in the health care sector, it also explores theoretical alternatives, including post-Weberian constructs of uncertainty and control, as well as franchise and asymmetric information in market transactions. Ultimately, it argues that patient medical care has become less and less affordable amid shrinking government subsidies, breakdowns of public insurances and increases in user charges, especially between the mid-1990s and mid-2000s. Whilst the government took decades to re-organize the public hospital system and rebuild public insurances, it faced a dilemma of enforcing both low-cost medical care and maintaining revenue flow to public hospitals through marketization. 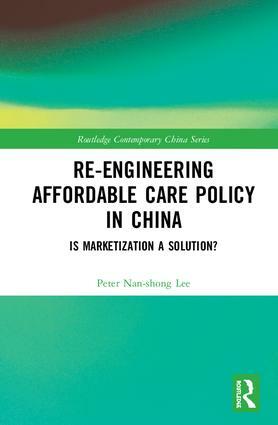 Re-engineering Affordable Care Policy in China provides extensive discussion of the policymaking process as well as detailed analysis of policy contents. As such, it will be invaluable to students and scholars of Chinese social policy and public administration, as well as Chinese Studies more generally. Peter Nan-shong Lee is Professor Emeritus at the Department of Political Science at National Chung Cheng University, Taiwan.